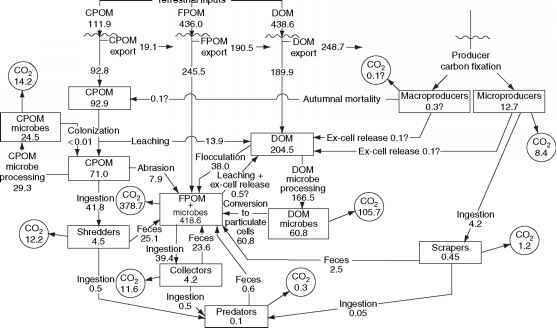 Though photosynthetic carbon assimilation is completely autotrophic, the production of new biomass by autotrophs is a combination of photosynthetic and respiratory metabolism. All plant tissues, including photosynthetic tissues, carry out mitochondrial respiration. Mitochondria provide the metabolic energy required for new tissue production, carbohydrate transport, and cellular maintenance at night. In addition, assimilation of mineral nutrients can require a substantial amount of metabolic energy from the mitochondria, particularly if the assimilation occurs in roots. Respiratory costs in plants consume a large fraction of energy and carbon harvested by the photosynthetic processes. In higher plants, it is estimated that respiration consumes between 50% and 70% of the photosynthetic energy acquired by plants. For ecologists, the most important aspect of autotrophy is primary production, which is defined as the production of new biomass from abiotic forms of energy and inorganic sources. Characterizing primary production can be confusing, because of the contribution of both photosynthesis and respiration to building autotrophic biomass. For this reason, two concepts are used to describe autotrophic production. These are gross primary productivity (GPP), and net primary productivity (NPP). Gross primary production describes autotrophic production that is directly linked to photosynthetic metabolism - in other words, the production of energy-rich carbon compounds and photo-assimilated mineral nutrients. GPP is most useful as an index of the biological energy input into an ecosystem. Except in simple algae, GPP does not closely reflect production of autotrophic biomass due to the loss of carbon from respiration. GPP is also not easy to quantify. GPP can be calculated by adding biomass accrued to an estimate of biomass lost; however, estimating the magnitude of loss generally requires detailed measurement, or substantial assumptions. Alternatively, GPP can be estimated through indexes of photosynthetic activity such as net CO2 uptake by an ecosystem, shifts in isotopic ratios in the air above a vegetation canopy, or remotely sensed measurements of chlorophyll content and fluorescence by vegetation or algae. All methods require multiple assumptions to convert the measured parameters to GPP estimates.